1. Preheat oven to 180°C and line 16 x 26cm baking pan with baking paper. 2. 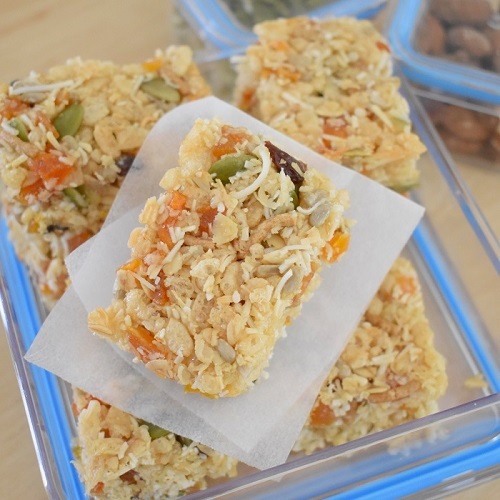 In a large bowl, combine muesli, rice bubbles, coconut, apricots and seeds. 3. Place butter, sugar and honey in a small saucepan. Heat over a medium heat until all ingredients are frothy. 4. Pour honey mixture into dry ingredients and stir well. 5. Press mixture firmly into prepared pan. Bake for 12-15 mins. Cool in pan, then cut into fingers. TIP : Store in an airtight container in the fridge for up to 1 week or in the freezer for 3 months.